Some may say Mick Whitehead (the owner of this red-hot GU ute) has dropped a Toyota engine into a Nissan body. Others would prefer to suggest he’s wrapt a Nissan body around a Toyota engine. Some will no doubt call this transplant total sacrilege with brand mixing at its finest… or foulest depending on which camps flag you may wave. Others will welcome him to an astute and elite club whereby he has the best of both worlds that no one vehicle maker has been able to deliver – a supremely capable 4x4 with coil springs all-round, comfortable cabin, combined with one of the finest 4x4 diesel engines money can buy that delivers huge torque, good fuel economy and excellent reliability. Either way, this combination of the two (arguably) most popular brands of 4x4 sees Mick with an extremely capable vehicle for both touring and fair dinkum offroad prowess. What this GU can’t tackle is probably not worth tackling! Kicking off with the ute he’s owned since new in 2001, complete with the Nissan 4.2 litre diesel naturally aspirated anchor, Mick has peddled it for just on 10 years in various guises – comp vehicle, tourer, with aftermarket turbo, air box, exhaust and suspension upgrades. While the GU did improve over time, Mick needed (or just plain ol’ ‘wanted’ is more like it) a better tow vehicle and highway performer. So, as part of that elite club we’ve mentioned above, he duly decided on a Toyota 1HD-FTE engine, transfer case and gearbox conversion. Having developed this exact conversion for some years, Jason Dymock at Total Care 4WD was the chosen workshop to be allowed to touch Micks pride and joy 4WD – a big decision for sure! Much of Mick’s GU ute had been tried and tested over a long period of outback use and so, wouldn’t be touched. The Old Man Emu 4-inch suspension with rear (in-coil) adjustable Airbag Man airbags, the 2-inch body blocks and those cool-looking alloy Classic 11 Mickey Thompson rims with 315/70R16 inch Cooper STT rubber all stayed as is. The ARB bar work with Warn 10,000 pound electric winch, huge rear-mounted 180-litre fuel tank and mid-mounted 60-litre water tank, together with the four IPF spotties (two halogen and two HID), super-comfortable Recaro pews, dual (GME and ICOM) UHF radios, various running gear-related gauges and trick camping tray with canvas canopy all stayed put – hey, what a tops setup! Mick had a few other mods, that had developed over time to get the whole show rolling better, which luckily could also remain untouched: Nissan 4.6:1 ration diff gears stuffed with ARB AirLockers being the biggie, which kept cruising revs just right when combined with the larger diameter rubber. 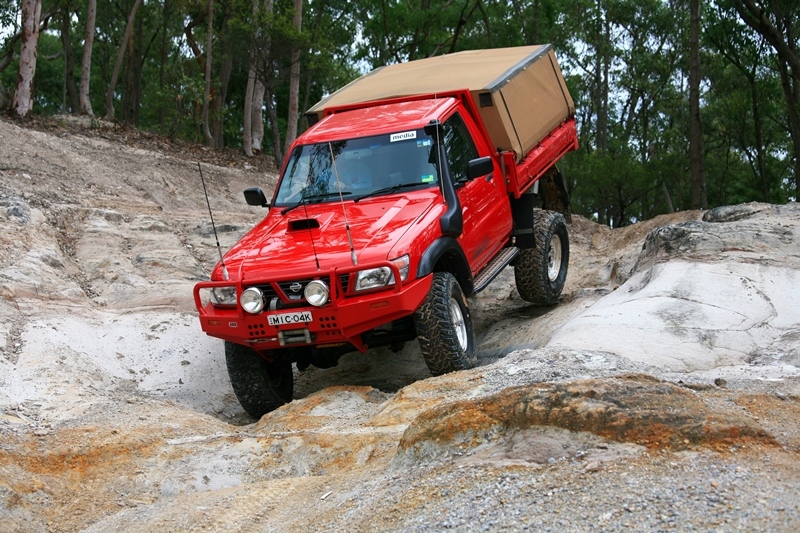 Then there are the lockers that would never be removed in a pink fit – a great weapon off road regardless of engine type! To make the whole job a little lighter on the hip pocket, Mick managed to sell off his Nissan engine, gearbox and transfer case which was all in tops nick. In its place, he’s opted for a LandCruiser 4.2 litre 1HD-FTE engine, with transfer case and 5-speed auto from a 100 Series Cruiser wagon with full time 4x4. Yep, this ute is now a push button, selectable 2WD to AWD for on road use, with central diff lock for offroad. Apart from that brilliant intercooled turbo diesel engine, Mick opted for a Steinbauer engine management chip upgrade with a 3-inch custom-bent exhaust system and a custom made top mount air-to-air intercooler sucking through a whooping bonnet-mounted air intake (too much power is never enough I say!) Mick and the lads at Total Care 4WD figure the upgraded Nissan pumps out (roughly) 560Nm and 195kW… whew that’s damn impressive! A gaggle of gauges reside on both the A-pillar and passenger side dash to keep track of everything that moves on Micks truck. Temperatures for engine, gearbox, exhaust, plus turbo boost and oil pressure all serve to alert if something should go awry. Having crawled all over this conversion, you’d be hard pressed at picking it wasn’t standard; it looks like it belongs and obviously has had enormous amounts of research done to ensure all went together like a jig saw. The complete upgraded Toyota driveline runs smooth in conjunction with the standard original Nissan steering and suspension. It delivers far superior power and torque outputs on the open road and has proved itself on a few long distance shake down runs, as well as offering cracking low range, offroad ability. When we first met up with Mick for this photo shoot, he insisted we jump in for a quick squirt up and down a few steep and winding high speed back roads – W O W why wasn’t this done from factory. The whole show looks and feels 99.9% factory-built. It runs smooth, maintains its temperatures, brakes well, handless better than standard and has bucket loads of power to climb, overtake and haul Micks caravan. Perhaps if we shout loud enough, a new marque may emerge… say Nissota or ToyTrol – who knows it’s worth a try! Some will say if you have to rebuild a vehicle, or swap, change and modify too much of it, then you’ve purchased the wrong one in the first place. I’d tend to say that if no one maker can provide what you want – build the bloody thing yourself and have the best of both worlds. Well done Mick for having the cashews under your kilt to be different. While there are plenty of DIYer’s and shops that have swapped all manner of engines in the past, this type would surely be near the top of the list for complexity: mechanically operated engine swapped to electronically controlled (drive by wire) version, manual gearbox swapped to auto, part time 4WD to constant 4WD, engine exhaust, air intake and cleaners / filters changed to opposing sides of engine bay, plus the usual tail shaft mods, engine mount changes and various holes in the floor for the new gearbox / transfer case sticks. That’s all the obvious stuff, then there’s the fact that if you purchased the new driveline without a key, peddle box (there are no mechanical linkages in the Toyota system remember) or other small components, then the whole show wont ‘talk’ with each other, leading to ballpein-hammer-inducing headaches and painful wrists from all that extra credit card swiping – it’ll cost you truckloads of extra cash just for the small parts individually, so purchasing a ‘complete kit’ initially is paramount. On top of that, there are the lessons only learnt the hard way: Total Care 4WD have done a whole fistful of similar conversions, specialising in this particular engine type and they know which sump (from other Cruisers) need to be mated to the engine to clear the solid axle at full suspension compression, which engine mounts get partially used and mated to the original and all the little tricks needed to ensure the final product looks and works like factory. While I was going to detail a few of these tricks in case you were going to give this job a go at home, the over-sized shifta’ that Jason (the proprioter and hands on fitter) quietly picked up and motioned my way during questioning, just wasn’t worth a cracked skull for me spilling the beans on what has taken him an awful lot of research and hard work to perfect. Basically, if you want to have a go – work it out for yourself… sorry. Put the shifta’ down now Jason – please. A last warning: unless you’ve got a hell of a lot of mechanical nous and savvy – leave this type of engine change to the experts or reap the dire consequences of Murphy’s Law – there is a hell of lot of expensive stuff that could go wrong… You’ve been warned eh!